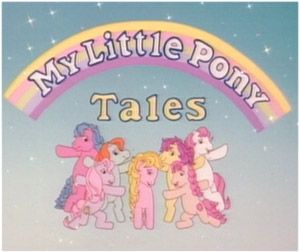 "Something is starting, right now, something is starting, oh wow..."
Released for TV in the early nineties, My Little Pony Tales is the second TV series based on the toyline, My Little Pony, by Hasbro. Unlike the previous incarnation like My Little Pony 'n' Friends, which was a fantasy/adventure series, this was decided to give the ponies a slice of life angle, and removed most of the fantasy elements. As the result, the only breed of pony in this series are Earth Ponies. Your mileage will vary on whether this was a good thing or not. The show was set in an unnamed suburb, somewhere in Ponyland. The show centered on seven pony girls named Starlight, Sweetheart, Melody, Bright Eyes, Patch, Clover, and Bon Bon. However, the show is notable for averting the Improbably Female Cast that My Little Pony normally prescribes to by introducing three male main ponies: Ace, Teddy, and Lancer. The show focused on their daily lives and how they dealt with things like stage fright, dating, personal responsibility, the environment, pets, cultural differences, school, trust, bullies, and other things normal kids deal with. This was the first of three attempts to make a Slice of Life style My Little Pony show. The producers did this to try to reach their core demographic, girls, who watched the original series but would be old enough by then to worry about any of the above issues the show tackled. Depending on who you ask, it may or may not have been a good idea. The series was met with mixed responses from its viewers and only lasted a single season of 26 fifteen-minute shorts as the result. Some see that as a good thing. Others think it was too good to last. Much like its predecessor, My Little Pony 'n Friends, the series was comprised of quarter hour shorts, but unlike before, shared its running time with no other properties. The series ran for twenty-six episodes told over the course of thirteen airings in 1992. Ad Bumpers: The show had its own custom ad bumpers and retained them for its 2015 U.S. DVD release, and possibly those in other markets as well. In "Battle of the Bands", Melody is unable to find a babysitter so she brings her little sisters Ting-a-Ling and Jing-a-Ling to the contest. She is forced to chase after them when they go missing. Bon Bon running away to the woods in "The Masquerade" when she thinks everyone at the party is laughing at her. Her parents worry about her getting lost but after they find her, she nearly falls off a cliff and it's clear they're very scarred for her. The King and Queen of the Isle of Pony lost their only daughter at sea when she was a baby and had no idea if she was alive or dead since. Aerith and Bob: The girl ponies usually had outright fantastical names, like Starlight and Bright Eyes, while the boys tended to have more normal names like Ace and Teddy. This even happened with supporting and one-off characters - one episode has a pony mention offhand that "Justin finally proposed to Moonglow." Ageless Birthday Episode: Averted in "Happy Birthday Sweetheart" where Sweetheart celebrates her tenth birthday. Agony of the Feet: In "The Tea Party", Clover accidentally hammers her hoof. All Girls Want Bad Boys: Sweetheart and Teddy (although in Teddy's case it's more like Jerkass Façade). And later, Starlight and Ace. All Love Is Unrequited: Starlight has a crush on Ace, who's far more interested in Melody, who's more interested in herself. Averted with Sweetheart/Teddy and Bright Eyes/Lancer, however. Alternate Continuity: Separate from the first cartoon; lacking most of the supernatural elements with few exceptions (such as the ghost pony and the UFO that turns out to be three pegasi and an alicorn.) and focusing on a completely different cast of characters. No humans, either. Always Identical Twins: Melody's baby sisters Ting-A-Ling and Jing-A-Ling are identical twins. Sweetheart's baby sisters are identical triplets. Ambiguous Situation: Brightglow and her fellows are believed to be a UFO, and are the only pegasi (or Winged Unicorn in Dazzleglow's case) in the entire series. It's unclear if they're ponies from somewhere else on the same world or if they're actually aliens. This is only amplified due to sharing features with both the toyline exclusive Sparkle Ponies (who all had some association with space) and the unmade Celestial Ponies, who were supposedly aliens, making it even more ambiguous. An Aesop: One per episode, many of them pertaining to friendship, not unlike a later incarnation of the franchise. So, Not So Different? Also, a good chunk of them dealt with real life...ish, subjects that many kids deal with. Animate Inanimate Object: The poor cuckoo clock seems to have life of its own, sometimes it can even retract back into the clock in fear. The most well-known in the series. Characters are periodically changing from moving like horses, to the semi-horselike behavior standard to the franchise, to being barely below Funny Animals. In "Birds of a Feather", Bon Bon runs out of food and complains that they'll starve to death, in a forest full of grass. Their solution is to go fishing. In "Sweetheart's Birthday Party," they sit around eating carrots and speak of being happy when they'll be able to eat real food again. In one Fantasy Sequence they go as far as giving one pony human breasts for a single shot, which is never explained. Apocalyptic Log: Invoked by Bon Bon in "Birds of a Feather", when ponies get lost in the woods and she tearfully decides to write a "farewell entry" in her diary, in case anyone ever finds it. Appease the Volcano God: In "Ponies in Paradise," when Bright Eyes visits a tropical island with an active volcano for an exchange program, her friends imagine this being done to her. Later, she imagines it herself when the other ponies speak of a former exchange student who is "not there anymore." Argument of Contradictions: Melody starts one of these in "The Play's the Thing" when she insists that nobody else can sport her new hairstyle because she has to stand out as the star of the play. Bright Eyes: He had the motive, the opportunity, and besides, he's very, very rude. Artistic License  Geography: Ponyville has a tropical island called "Tropical Island" that somehow qualifies as "foreign" despite being close enough to be seen from a hot air balloon over Ponyville. Long shots of the planet show it's identical to Earth, placing Ponyville in the suburban United States, meaning Tropical Island isn't actually in the tropics. They don't even have the benefit of saying it's magic, as there isn't anything even remotely supernatural in this generation (with one or perhaps two exceptions — see How Unscientific! and Real After All below). Ascended to Carnivorism: Following the Anthropomorphic Shift trend, in this incarnation of the franchise ponies are completely omnivorous: besides the more pony-like diet like carrots, they also eat burgers (and not the veggie variant, from the look of it), fishes, and even frog legs. In the opening, ponies get to the school by bus, while in the actual series they always just walk there and the bus itself never makes an appearance. When rushing to the abovementioned bus, Starlight is seen running out of Melody's house, meanwhile the brief view from Melody's window looks much more rural than the street her house is on. During the Theme Tune Roll Call, Melody is seen playing guitar with three unknown ponies instead of her bands The Rockin' Beats. Later in the opening, there's a scene of Bon Bon working behind the counter at the ice cream shop alongside Starlight, while in the series proper only Starlight and occasionally Sweetheart work there. Be a Whore to Get Your Man: Subverted in "Roll Around The Clocks": Melody leads the other girls in giving Bright Eyes an Unnecessary Makeover while Lancer is given a similar overhaul by the boys. Both makeovers wind up backfiring, as they reject each other's new looks and attitudes. It's only when they start dressing and acting normally again that they quietly get together, much to Melody and Ace's confusion. Big Ball of Violence: In "Shop Talk", Teddy gets into one with Ace and Lancer when the two tease him about his teddy bear. Big Eater: Bon Bon is seen eating many sweets. She even eats a cookie right after waking up in the intro. At one point, the gang had packed a week's worth of food and turned to find Bon Bon had just eaten all of it. Bigger on the Inside: The relatively small schoolhouse can somehow fit a gym, a cafeteria and an auditorium that seems bigger on its own than the entire school building as seen from the outside. Bilingual Bonus: The name of Meadowlark's fiancee Cheval; it's actually a French word for horse. Done to Ace and Lancer in "Shop Talk" when the girls lure them into doing something embarrassing to entertain some baby ponies they're babysitting, then take pictures and threaten to expose them unless they stop teasing Teddy. Teddy also threatens to show Ms. Hackney the entry in "Bon Bon's Diary" that says she cheated in a test unless she goes to the school dance with him. And he was stopped by Sweetheart threatening to reveal his Unmanly Secret. In the Polish dub, Cheval's name, which is French for "horse" (because he's a pony from France), was literally translated as "Koń", ("Horse"), thus ruining the joke and making no sense in-universe. In the Russian dub, Patch's roller skating partner named Buddy (like Buddy Holly, for example), was translated as "Приятель", which is Russian for... "Friend". Bowdlerise: In Patch's ghost story, the knight pony's task is to tame a dragon. Brain in a Jar: What Melody and Starlight disguised as Martians pretend to want to do to Patch as a part of their prank. Bridezilla: Inverted in "Sister of the Bride". Meadowlark manages to keep a level head when her parents panic over Clover and her friends jeopardizing the ceremony. Cat Scare: Seen in "Slumber Party" when the girls investigate a noise in the attic. Changeling Fantasy: "Princess Problems" turns it on its head, as Patch is horrified at the thought she might be a princess and have to leave her friends and adoptive family behind. Played straight when she realizes fellow orphan Rosy is the real lost princess. Circling Birdies: Clover gets the spinning stars and planets with the sound of chirping birdies variant in "The Play's the Thing" while being spun around in a barber's chair. Cloud Cuckoo Lander: Patch has traits of this trope, being shown as a very eccentric and ungirly girl rather than strictly a stereotypical tomboy. She acknowledges her own weirdness, but couldn't care less about what others think of her behavior. Continuity Nod: In "Battle of the Bands", Bon Bon can't babysit Ting-a-Ling and Jing-a-Ling for Melody because she's been grounded, likely for Playing Sick in the previous episode "Too Sick to Notice". Courtroom Episode: "Stand by Me" which has Teddy put in the class's mock trial and attempting to claim his innocence when he's accused of stealing Melody's tape player. The DVD releases of the show in Australia has cover art of "G2" ponies. As an even more extreme example, a German DVD also used "G2" cover art, but with the "G3" logo. And Shout! Factory's complete boxset uses the G3 logo too. Crosscast Role: In "The Play's the Thing", Patch plays the role of the prince. Dark Reprise: "The Perfect Pair" has one in "Just For Kicks" when Starlight decides that she and Ace just might not be the perfect pair. Death of a Child: Implied aversion with Squire, whose ghost is still a child. Sweetheart: What about the motive? If you have a tape recorder of your own, you wouldn't need to take Melody's, right? Teddy: Yeah, but I don't have one. I'd do anything to get one. Dude, Not Funny! : In "Gribet", the girls pitch in and help Sweetheart nurse an injured frog back to health. Bon Bon says her mother has a great recipe for frog legs, earning a Death Glare and a Say My Name from Patch. Easily Forgiven: The Sunbright family is surprisingly chill about the fact that Bright Eyes pretty much imagined their culture as cannibals and murderers, or that in her fit of panic she bashed Mr. Sunbright on the head with an oar several times. Edutainment Show: It was one of the first slice of life type show to enter the market back when the market lacked shows of said genre. Expy: Most noticeable with the similarities between Shady from the previous TV show, MLP and Friends, and Clover here, with both being generally lacking in confidence AND being somewhat clumsy (Clover obviously more so than Shady). The first episode had the girls facing their fears of sudden noises in the attic after hearing a ghost story. In "Blue Ribbon Blues", Teddy overcomes his fear of water to save his cousin Corny. Fantastic Racism: The main cast (who are kids and likely wouldn't know better) believe that tropical ponies practice cannibalism and make pony sacrifices to the volcano. Partially justified, as some scenes (like Bright Eyes' introduction in the opening) show that ponies can wrap their hooves around objects like rubber. A very subtle one. In "The Great Lemonade Stand Wars", the camera focuses on Lancer throwing away a paper cup and missing the garbage can after Ace and Teddy both hit it. This doesn't come up in the episode and seems just to show Lancer isn't like his friends. In "Blue Ribbon Blues" ,Teddy ends up accidentally losing an entire picnic basket and its contents into the water which gets washed away and no one ever retrieves them. This seems just to be the inciting incident for the episode, but the Season Finale focuses on the fact the townsponies being careless with their trash and throwing it away recklessly clogs up the river and floods the town, with several ponies doing that exact thing during the episode. They'd been doing it multiple times throughout the season. In "The Impractical Joker", Patch's response to seeing the fake flying saucer her friends are using to prank her is to excitedly shout she 'always knew they existed'. Come "Up, Up, and Away", a real UFO appears and she is likewise excited about it. She even meets the UFO, who may or may not actually be aliens. Free-Range Children: The main cast is around 10 and they are allowed to go all alone to the observation point on the top of a tall hill after dark, or to stay long hours in an abandoned house until Sweetheart complains their parents might start worrying about them, and when their teacher falls ill the entire class is left to their own devices, which of course they use as an opportunity to go on a field trip to an off-limits cave. Freeze-Frame Bonus: During the Fantasy Sequence in "And the Winner is...", we see Clover switching channels on a big TV. Among the many briefly visible pictures, some of them just small miniatures on 4x4 or 8x8 grids, are the Santa Maria ship, Muppet Babies, a dog carrying a mallet, a duck, a rocker pony, a highway junction, a Shinkansen train, a jet fighter, a helicopter, a desktop computer, a guitar, a seaport, and even a pair of human laced boots. Funny Animal: Pretty much. The characters may look like My Little Pony ponies, but their behaviors and concerns are human. You know you're dealing with a Slice of Life show about human-like characters when the kids stand around discussing their problems with their parents as they wash the dinner dishes. Furry Confusion: See Feather Fingers. Furry Reminder: Although the series is infamous for its Anthropomorphic Shift with constant use of Invisible Anatomy, there are several instances of ponies carrying objects in their mouths, mostly when they have something on them in the scenes where it was easier to animate them on all fours. Genre Shift: From fantasy to slice of life. Fans tuned in hoping to see ponies and Megan fighting evil. They got something along the lines of Arthur (or if you want to be period-accurate, Doug) instead. That said, some episodes do shift back to fantasy elements. Normally when Patch is involved. The animators seemed to be rather fond of Bon Bon's rear. She also got bedroom eyes and even breasts on a few episodes. One Imagine Spot featured Bon Bon as a cover girl for a magazine. She's wearing a onepiece bathing suit that resalts her breasts and next to her, two young mares (dressed as nurses) are hugging while they stare deep into each other's eyes. Considering the scene is about modeling one can guess Bon Bon understands what 'adult' models do. The episode "Birds of a Feather" had Ace and Bright Eyes massaging her rear end and flanks. Granted, they were just rubbing mud onto her nettle-stings, but still. Overall, most of scenes from Bon Bon's fantasy sequence in "The Masquerade" could count as this, the above mentioned cover girl example being just one of them. Gossipy Hens: Melody and Starlight in "Shop Talk", kicking off that episode's plot when Sweetheart won't participate. Also relevant with Mrs. Barrington/Berrytown in that same episode, where she gossips to Starlight's mother while Starlight's mother is giving her a hair/mane treatment, inspiring the seven main girls/ponies to gossip as well. Got Volunteered: "Stand by Me" seems to have variant 4 in the classroom trial when a defending attorney is needed for Teddy and everyone except Sweetheart steps backwards. Subverted when she then steps forward and says she'd be happy to do it. Green Aesop: "Who's Responsible", and to a lesser extend "Birds of a Feather". "Gribet" could count too, since Sweetheart learns that a frog needs to be in its natural habitat. Happily Adopted: Patch, and in "Princess Problems" she's not happy about the idea of having to leave her adoptive family. Happens twice to Teddy in "Stand by Me". Also in "Blue Ribbon Blues", Teddy saves his cousin when he becomes trapped in a river. Mrs. Bloom: Many hooves make light work. Hollywood Natives: Played straight in Bon Bon's fantasy in "Ponies in Paradise", complete with grass skirts, war paint, chanting in pseudo-native gibberish and cooking other ponies in a giant pot. Completely averted when Bright Eyes actually meets tropical ponies in person and her first reaction is remarking to herself on how normal they look. "Home Alone" Antics: In "The Tea Party", the girls booby trap the abandoned house they've been using as a clubhouse when they discover some ponies stealing their furniture. It turns out the "thieves" are just a family who have been fixing up the place before they move in. The girls, feeling bad about what they have done, decide to make up for it by helping them out. How Unscientific! : The episode "Up, Up, and Away" features a UFO, which turns out to actually be pegasi and an alicorn hidden by the light shining from their travel. Human-Focused Adaptation: Rare example of an inversion — this and all series that followed were completely human-free. However, in a way, this does fit it - the focus is on humanlike characters in an Earthlike world. Insane Troll Logic: Patch exhibits this in "Who's Responsible?" Patch: Anyone who makes schoolbooks can't be completely on the up-and-up. Sweetheart: What?! But I like school. Patch: See? They've even got you brainwashed. Invisible Anatomy: The Ponies can hold objects, grip on things, press buttons, play musical instruments, hold small pencils and operate precision machines, using just their hooves. Subverted in some scenes, where pony hooves are actually shown to be pretty soft and as a result able to grip on objects on their own without the need for fingers. Patch: Hey Clove, why don't you make another wish so we can all go home? Clover: Okay. Maybe it will work this time. Jerkass: Everyone took turns to be this against each other, but Melody, Patch, Ace and Teddy were the biggest offenders of all. Jerk with a Heart of Gold: Again, everyone: they always learn their lessons in the end and usually didn't have malicious intent in the beginning. Teddy was really intended to be this type of character, but in practice, we've only got Sweetheart's word to suggest that Teddy is a saint with a Jerkass Façade, as most episodes that heavily feature him basically make him the villain of the story, and he learns his lesson at the end just in time to get Aesop Amnesia by the next time. Ace, the designated jerk character, on the other hand, fits better as he has more than one Pet the Dog moment that wasn't forced on him. Karma Houdini: In "The Impractical Joker", Patch somehow gets away with sabotaging Bright Eyes' term project right in front of the teacher and not even trying to hide with it. The Kiddie Ride: This Youtube video's description says it all . For those unable to see the video: The rides were made in the early 90s and were modeled after My Little Pony Tales characters. They were licensed, but frequently mismatched the color of the ponies with their symbols. Kill It with Fire: In Sweetheart's fantasy in "Ponies in Paradise", tropical ponies throw an unnamed female pony into an active volcano, which then bursts with flames. Lady Land: Until My Little Pony: Friendship Is Magic, this was the sole aversion of the My Little Pony franchise. The core cast and most of the other characters who do most of the talking are female, but in addition to Ace, Teddy, and Lancer as oft-seen recurring classmates of the gang, we have two-parent families, and in one episode a king and a queen. Late for School: In the opening, Starlight is seen rushing to the school bus with a book in her mouth and dropping her school supplies while trying to pack her bag on the way. Leave the Two Lovebirds Alone: Used at the end of the episode "Just for Kicks". The scene of Melody climbing up the spiral staircase from "Impractical Joker" is the same sequence looped twice. The shot of an erupting volcano from Sweetheart's fantasy seqience in "Ponies in Paradise" is later used in the opening shot of the island, even thought later in the episode it was mentioned that the volcano hadn't erupted in many years. Locked in a Room: Lancer engineers this to force his quarreling friends to reconcile in "Happy Birthday Sweetheart". His version involves stranding the lot of them on his father's private yacht. Losing Horns: The "Sad Trombone" is briefly heard in the background right after Sweetheart sneaks an embarassing photo of Lancer and Ace in "Shop Talk". Lost Aesop: In "Just for Kicks", Starlight joins the soccer team hoping to impress her crush Ace (as suggested by their teacher), but he keeps humiliating her out of jealousy towards her natural skill. She goes on to score the winning goal, Ace storms off in a huff, and her friends are thrilled for her, so it seems like an episode about trying new things, but Starlight laments that she only joined the team in the first place to get Ace's attention. This makes the moral seem like "stay true to yourself and don't try to fit another person's ideal. ", and it could be if Ace didn't show up in the episode's final minute to ask Starlight out. It's not so much a broken aesop as a very muddled one. Lost Orphaned Royalty: The plot of "Princess Problems" revolves around the King and Queen of the Isle of Pony coming to Ponyland as part of their long search for their lost daughter. Naturally, Patch matches all the descriptions. She's ultimately not happy about it at all, as she's Happily Adopted and is scared of the prospect of losing her adopted parents. Subverted when it turns out she wasn't the lost princess; her old friend from the same orphanage Rosy is, and is reunited with her long lost parents. Love Triangle: Starlight loves Ace but Ace loves Melody. Melody is actually relatively uninvolved, as she isn't interested in him and wants nothing to do with him. Merchandise-Driven: Not quite as much as the other incarnations of the franchise, but the schoolhouse, for example, was based on a playset, which explains why it is so conspiciously pink among otherwise normal Ponyland architecture and why it is inexplicably equipped with a slide for an exit. Mistaken for Murderer: See Poor Communication Kills below. Bright Eyes thought that the tropical ponies had killed the last exchange student and were going to do the same to her. Mythology Gag: When Bon Bon is standing dressed up in front of her mirror at the end of "The Best Dream" song, she has a bow tied on her tail, like ponies in the original My Little Pony series had. Never Say "Die": Mostly Played Straight, like Patch's ghost story mentioning a knight who "would never again see the light of day", although Bright Eyes briefly talks about pollution potentially killing all the fishes in one episode, and one of the songs has a line "I'd die if people knew my secrets". Nice, Mean, and In-Between: The three boy ponies who played as either supporting characters to the main cast or antagonists depending on the episode. The quiet and kindhearted Lancer is the nice one and actually gets along with the main cast pretty well when his friends aren't around, Ace is the mean arrogant Jerk Jock but even he shows a kind side occasionally, and Teddy is the in-between: a petty bully and prankster but also has Hidden Depths and really cares for his best friend Sweetheart, but even she isn't immune to his shenanigans. No Antagonist: This was one of the things that drew the slice of life fans to the show. The only "villains" on the show are the jock type ponies, if they're even considered villains to begin with. No Cartoon Fish: Averted in "Birds of a Feather", where ponies can't bring themselves to eat the fish they just caught because of its sad face. No Hugging, No Kissing: Although the series does have its share of light shipping, there's barely anything romantic actually going on. Teddy and Sweetheart seem like they were supposed to be the Official Couple, yet there isn't much going on between them besides hanging out, and many times they actually refer to each other as "friends". Then there's "Roll Around the Clock", where everyone acts like Bright Eyes and Lancer were going on a date, but all they did was entering a roller skating contest together and then barely even talked to each other after that. And although the ending of "Just for Kicks" feels very shippy, it doesn't get further than Ace talking with Starlight about soccer, and that's the last the two are seen together in the series. Probably justfied though, considering that the characters are supposed to be around ten. No Party Like a Donner Party: One Imagine Spot in "Ponies in Paradise" involves rumors that tropical ponies, in the middle of a famine, turn into horses of Diomedes, complete with Captured by Cannibals imagery. Boy, the animators cut a lot of corners when making this series (This is AKOM we're talking about after all). For example, when the ponies are facing to the camera, they become something hideous. Bon Bon's weight shifted among episodes as if the animators couldn't decide if she was pudgy, fat or a complete porker. Out-of-Genre Experience: "Up, Up, and Away." We go from plots like "Bon Bon hides her bad grade" or "the girls and the boys run competing lemonade stands" to "There's a UFO... oh, wait, it's just three pegasi and an alicorn flying around the world in the form of a blinding light nobody can see through unless they want to reveal themselves." It's even kicked off by Patch wanting to do something adventurous and picking something significantly more dangerous than what your average kid could stumble into doing. It bears more than a passing resemblance to some of the future adaptations. Paranormal Episode: The episode "Up, Up, and Away", notable for being the only episode featuring non-earth ponies - who were otherwise absent from the show as this iteration had removed most fantastic elements. Polyamory: Seems to be the case between Teddy and Sweetheart, as the latter has no problem going on a date with a band leader (even though it turned out to be a prank by Patch) while the former hits on Bon Bon in "Bon Bon's Diary". Granted, their relationship status is pretty vague to begin with, sometimes they simply refer to each other as friends, although Teddy calls Sweetheart his girlfriend in "Blue Ribbon Blues". Ikki: The last time we went to the volcano was when we had another pony visiting us from the mainland. Bright Eyes: What happened to that pony? The Prankster: Patch and Teddy. Both have taken it too far, to the point where Patch sabotaged Bright Eyes' class project and caused its failure while Teddy got the girls disqualified from a swim meet. Product Placement: There is one episode where two ponies are revealed to be drinking Coca Cola, as they clearly state that they are "Cokes". ''Psycho'' Strings: These are used in "Out of Luck" when Clover returns home and spots the teapot she believes is making her unlucky. They resurface later when the teapot is returned to the house again. Public Domain Soundtrack: In "Send in the Clown", they put on The Nutcracker. The actual Tchaikovsky ballet. Real After All: Patch's ghost story in "Slumber Party" it would seem, as the ghost of the story character Squire appeared to thank Patch for telling the story. Reasonable Authority Figure: Rather unusually for a show of the time (and in fact many programs), every adult featured in the show is this. The girl's parents are Good Parents, the mayor of the town declares the area the girls discover the endangered Green Winged Songbirds in protected, Mrs. Hackney is stern but very fair to the point of allowing Bon Bon to retake a test she cheated on when she confesses on her own with genuine remorse, Logan's parents take being ambushed in their own home are completely understanding once their reasons are explained, and while initially mad, the King of the Isle of Pony hears the girls out when they present Rosy to him and give her the same test as everypony else to see if she's their daughter after Patch threw mud at him to get his attention. Even the police officer in "Up, Up, and Away" who blocks the girls from going up to see the UFO only does so because the area is potentially dangerous for completely different reasons (reasons that nearly got Bon Bon killed earlier in the series). This trope is also present with the Barrington/Berrytown family to a lesser extent than Meadowlark and Cheval. After being introduced in "The Tea Party", none of the members of the family appear for the rest of the show's run. Schizo Tech: Ponies have desktop computers and... steam trains. Also, the cars on the streets range from pre-war vans to modern convertibles. Schoolgirl Series: Despite the limited appearance of guys, the series essentially fits the definition. Series Continuity Error: Throughout the series, Patch seems to like to read and often talks about books. Then in episode 26, she suddenly has a problem reading a sign that says "Recycling plant". Short Runner: The show only got one season of 26 episodes. The Two Shorts format means it's actually thirteen. During the Fantasy Sequence described above, we can briefly see Lawyer-Friendly Cameo of Kermit and Miss Piggy from Muppet Babies. The girls speak like Yoda when they don alien disguises to trick Patch in "The Impractical Joker". The title of the episode "The Play's The Thing" is a line from Hamlet. In "Just For Kicks", Patch says: "The thrill of victory... The agony of defeat!" Show Some Leg: Bright Eyes and Melody do this to Lancer and Ace in order to trick them into babysitting Sweetheart's baby sisters. Slice of Life: The basic style of the show. Heck, the fact that the show's opening sequence depicts the characters getting out of bed, brushing their teeth, taking a shower and going to school tells you something about this straight off. Stock Animal Name: The frog in "Gribet" is named "Spot." Normally, of course a stock name for a dog, but still a stock name nevertheless. "Super Sentai" Stance: Performed by the ponies at the end of the opening (with waving included to make it more friendly). Surprise Party: Sweetheart is presented with one at the end of "Happy Birthday Sweetheart." "Happy Birthday Sweetheart" sees the other girls telling Sweetheart she has to choose between them or Teddy: either uninvite him from her upcoming party, or none of them will come. Sweetheart responds by tearfully canceling the party. When Clover wins two concert tickets in "And the Winner is...", instead of picking one of her friends to go with her, she decides to hold another lotto with both tickets up for grabs. Melody and Clover win, but wind up pawning them off for pizza money and watching the concert on TV with the rest of the girls. The Tape Knew You Would Say That: In "An Apple for Starlight," Ms. Hackney has to leave class because she isn't feeling well, but puts Starlight in charge and leaves behind a tape player and a tape with everyone's lessons on it. It's soon proved that she's somewhat skilled in this, though it's still not enough to keep the kids from acting up because she's gone. When a bird pokes a hole in the hot-air balloon, Patch says "At least the flame is still burning". Sure enough, it goes off afterwards. After the flame does go out, obviously, they start falling down to the waters below, and Bon Bon asks "What else could possibly go wrong?" Cue the sharks. Tertiary Sexual Characteristics: The only way to tell a background pony's gender is by its single clothing accessory or by the length of its mane. And sometimes, not even then. Half of Teddy's farming cousins, who wear pink coats and have long, curly rainbow-colored manes, are male. And the father looks identical to the mother, but that's a different trope entirely.... This is actually more realistic than it seems, as horses really don't have much in the way of obvious sexual dimorphism, so clothing or mane style being the only differing feature is logical. That Reminds Me of a Song: Once an Episode... or twice, if consider the Two Shorts format, for a total of 26 songs, or 27 if you count the theme song. 28 if you consider the fact that "The Perfect Pair" in "Just For Kicks" has a Dark Reprise. Theme Tune Roll Call: Well, for the core female ponies anyway. ''Starlight, Sweetheart, Melody, Bright-Eyes, Patch and Clover/Bon Bon's baking cookies, girls, hurry up on over! Title Theme Tune: "My Little Pony, My Little Pony, My Little Pony Tales! My Little Pony, My Little Pony, My Little Pony Tales!" Bon Bon: Want to catch a boy's eye? / Bake a chocolate cream pie! Totally Radical: A pretty mild example, but whenever it does occur, it tends to stand out due to the overall nature of the show. Melody: Far out... Let's have a tea party! Twice Shy: Bright Eyes and Lancer, until their Relationship Upgrade in "Roll Around the Clocks". Two-Teacher School: Besides miss Hackney, the only other known members of the staff are mr. Tidwell, who works as a janitor/groundskeeper, and the coach, who is briefly mentioned but never seen. And miss Hackney's area of teaching seems to cover fields as diverse as math, literature, physics, economy or law. When she fell ill and had to leave early, she assigned one of her own students for the role of a temporary substitute, suggesting there are no other teachers. Unmanly Secret: Teddy didn't want anyone to know he has a teddy bear. It's hard to pinpoint the exact age the main characters are supposed to be, considering that their behavior and the things they're into could point to anything between six and sixteen. Averted with Sweetheart, who turns 10 in "Happy Birthday, Sweetheart". Vinyl Shatters: Averted in the episode "Roll Around the Clocks"; when Bright Eyes falls while carrying a huge stack of records at the roller rink, they stay in one piece, and are still perfectly usable. What the Hell, Hero? : Lancer calls out Teddy and the rest of Sweetheart's friends when their feuding leads to her miserably cancelling her own birthday party. Why Did It Have to Be Snakes? : Teddy in one episode is revealed to be afraid of water. Winged Unicorn: "Up, Up and Away" features the four Glow 'n Show Ponies with wings, despite only Starglow being a pegasus in the toy line. Dazzleglow, a unicorn in the toy line, has both wings and a horn here. With Friends Like These...: The plot for "The Great Lemonade Stand Wars" kicks off when the girls play Keep Away with Bon Bon's diary. You Mean X Mas: Averted. The series never had a holiday episode but Ponyland seems to celebrate Christmas. The holiday was mentioned briefly on two episodes.